When you have been working outside under a hot sun for most of the day there is nothing in the world as refreshing as a dipper full of deep-well water cooled by nature. And after drinking your fill you can, perhaps, pour a dipperful over your head. It beats air conditioning for sheer instant relief. Then you can slap your ball cap back on your wet head and you are good for a few more hours on the tractor until you hear that welcome call to supper. Dempsey Essick grew up on a farm so he is no stranger to tractors and plows and hot summer sun. In the days before farmhouses were air conditioned an electric fan in the parlor and a shady front porch were welcome respites from nature’s heat and for real relief all you had to do was walk out to the pump house and run a pitcher of that clear, tasteless water cooled to perfection by mother nature. The painting covers just a bit more than a square foot of the side wall of the pump house on Dempsey’s Dad’s farm but, with Dempsey’s rendering of the exact details of the wood grain, the rough finish of the bricks with a broken out section for the water faucet, and the rusty nail with an enamel ware dipper the viewer can sense the shade trees around the farm house and the sounds of the cows at milking time. And, if you let your imagination run freely, you can smell the country ham and black-eyed peas cooking on the wood fired stove out in the kitchen. Dempsey’s painting does what a painting should do. It fires up the imagination so that every time you stop and look at it, even if it does only cover a few square inches, you can picture the whole farm and hear the cows and the tractor and the sound of a rocking chair on the front porch and the sound of a breeze through the branches of the hickory nut tree. 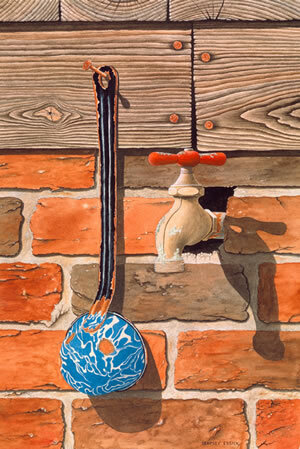 “Pump House Shadows” groups well with “Wait Your Turn” which also features brickwork and the blue graniteware. A sister piece to “Pump House Shadows”, same size and coloration” is expected to be released in the near future.